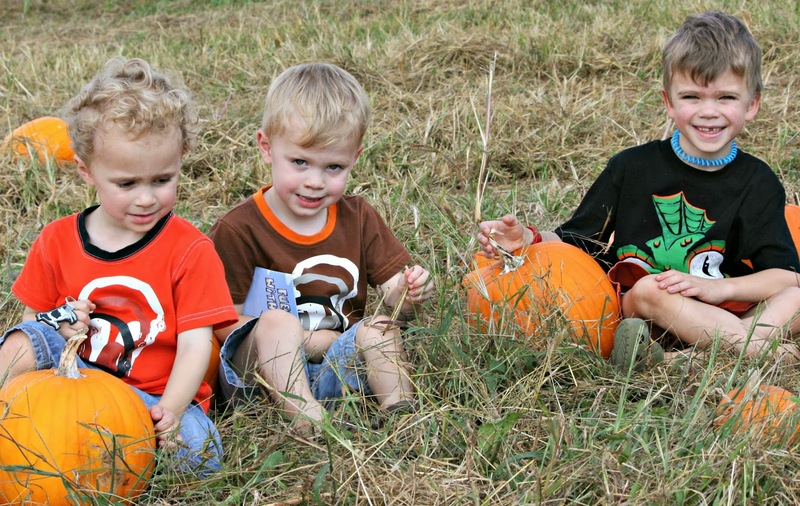 One of the things I look forward to the most about fall is going to the pumpkin patch and getting our pumpkins. It's really not fall until there are pumpkins sitting on our front porch. This year we tried a smaller, family run business called Thee Red Barn for our pumpkins, and each of the boys found just the right size pumpkin for them. Once we got the pumpkins home, we started looking through the awesome assortment of pumpkin carving tools we received from Pumpkin Masters. There were so many choices! I let each boy choose the design for their own pumpkin. They helped in scooping out the pulp, using a special scoop provided in our supplies. Once designs were picked, I taped them on and started carving. I was impressed by how well the tools cut into the pumpkins. The cat was easier to carve than I expected - having the pattern taped on made it so easy. Their tools are definitely safer than using a kitchen knife - I didn't have to worry about cutting myself. I had a slightly harder time carving the owl - it used the razor tool for cutting. It didn't turn out exactly like the pattern, but I thought it still turned out cute. 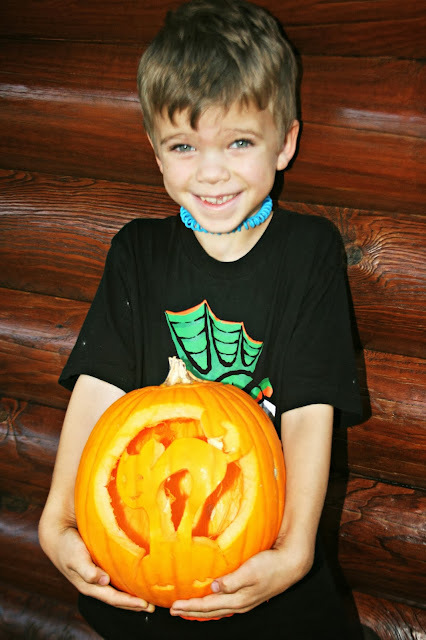 Cort chose a spider with little eyes, and his was also easy to cut out. What an enjoyable way to spend an afternoon bonding with your family! You can find Pumpkin Masters in your local grocery stores, Walmart, and Target. Pick up a carving kit and you can enter their annual pumpkin carving contest for a chance to win some really fun prizes. 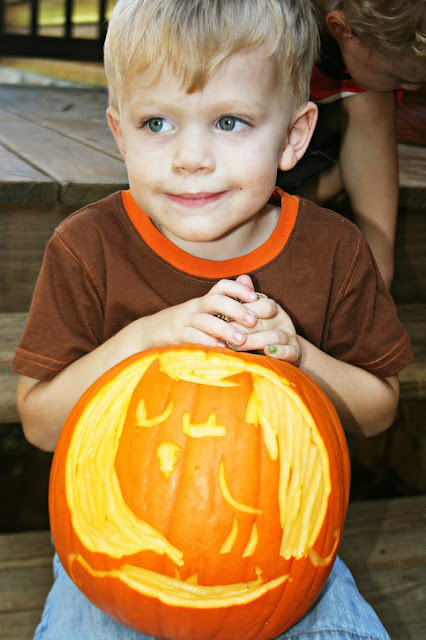 Share your carving on Twitter or Instagram with #PumpkinMasters2013 as your hashtag. Or email it to social@pumpkinmasters.com. The contest runs through October 31st. You can find official rules and details here. Want a chance to win your very own Pumpkin Masters kit assortment, a $35 value? There will be one lucky winner - just click on the Rafflecopter below! The cat from the Creature Features pattern book would be cute to carve. What great fun! We need to gather some carving materials to use at our house. Fun, fun, fun, and SO cute! soooo cute, and those boys, ADORABLE!!! The pumpkins look great! And I agree with you - it's not fall until you have some pumpkins on the porch! Awesome! And you did a really great job!!! Carving really is much harder than it looks. We got only the double edged saw knife, I think it is this brand, but now I want the whole kit! Now to see if I can make this entry thingy work! My daughter would love a black cat pumpkin! The Sensational Shadows book looks like it has some neat patterns! Oh my gosh...they did such a great job! Love them all. Such happy smiles and cute photos. Cute kids and cute smile.. Nice post. I like the headless horsie pattern they have. That would be fun to create. 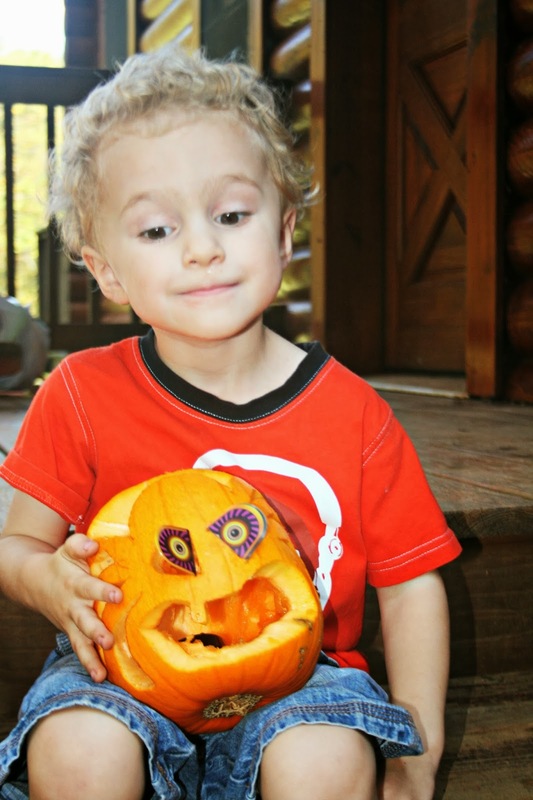 Happy Hal free pumpkin carving download for sure! Be careful about leaving pumpkins outdoors. I saw a photo today of a bear tearing up a pumpkin! I'd like to carve something from the nightmare before christmas. I'd love to carve the Bone Voyage pattern. Thanks!